Well done to all Worcester paddlers who have taken part in the Waterside series and good luck to all doing the latter Waterside races and Devizes to Westminster this year. There was a good turn out for the first race of the series, with Pascal and Kieron taking 3rd in Junior K2, Paul and Gary taking 14th in Senior K2, Bob and Daryl taking 22nd in Veteran K2 (their first ever race), and Katie placing 14th in Ladies K1. 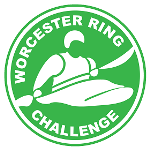 The Worcester Ring Challenge is our 15 or 20 mile circular event through the beautiful Worcestershire countryside. This year it is on Saturday 14 July 2018 and entries are open. You can speed round (the record in a K1 is under 3 hours) or cruise it. It’s a challenge either way. Racing boats, open canoes, SUPs, tourers, sea kayaks, everyone is welcome. Just a reminder there is a handy link to the Environment Agency website over to the right. Their Barbourne River Guage shows the current and recent level and Robin’s River Rising Ready Reckoner tells you what it means – can you see the stage, are your feet wet or Pitchcroft underwater? Worcester got an excellent turn out at Hereford with 26 paddlers racing and finished on 220 points in second place behind Hereford who finished with 234 points. The official results can be found here. Lots of Worcester paddlers finished on the podium and some got promotions. In K1 Pascal Bauer finished 3rd in division 3, Mike Case finished 2nd in division 6, Maggie Noke finished 3rd in division 7 and got promoted to division 6, Victoria Young finished 2nd and Amy Green finished 3rd in division 8 and both were promoted to division 7. In K2 Chris Skellern and Fess came 2nd in division 5 and were both promoted to division 4.